In November 2012, the UK's Crown Estate confirmed that three organisations have secured rights to progress with the development of tidal energy projects at eight sites around the UK. Dr Nicola Davies examines the UK's tidal potential and looks ahead to a surge of new projects and technologies likely to make waves in 2013. The system has been extensively trialled through scale model testing and a 250kW prototype, the SR250, is currently generating power in a two-year test programme in Orkney. These include the operational mode, with the rotors down to generate power, or the transport / survivability mode, with rotors retracted. The system converts energy from tidal stream flows into electricity, using a similar technique to that of a kite. As water flows over the hydrodynamic wing, a lift force is generated allowing the device to move smoothly and the turbine to rotate. As part of the EcoIsland sustainable initiative, the Isle of Wight Council and the Solent Ocean Energy Centre (SOEC) plan to place prototype tidal energy turbines off St Catherine's Point. The frequently changing tides around Britain’s coastline speedily provide large volumes of water that can be used to generate electricity. Indeed, since water is about a thousand times heavier than air, the maximum speed of the tides – around five to six metres a second – are capable of generating more electricity per water turbine than that of a wind turbine. Harnessing this energy could provide around 20% of Britain’s electricity needs. There are only around 20 sites in the world identified as potentially suitable tidal power stations, eight of which are located around Britain, including the Severn, Isle of White, Orkney and the Humber estuary. In the past, tidal barrages would have been placed on these sites to harness energy. While tidal barrages can be successful, they bring numerous problems, as they effectively ‘dam up’ a tidal estuary, making it inaccessible to water traffic. They also have an environmental impact, affecting the migration of sea life and altering the tidal range of the estuary, which can affect wildlife along the shoreline. Fortunately, however, technology for harnessing marine energy is advancing rapidly, providing a number of other, more viable options. "There are around 20 sites in the world identified as potentially suitable tidal power stations, eight of which are around Britain." 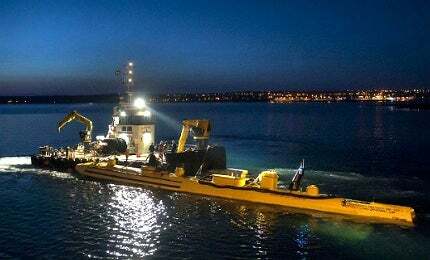 As part of its EcoIsland sustainably initiative, the Isle of Wight Council and the Solent Ocean Energy Centre (SOEC) plan to place prototype tidal energy turbines on the seabed off St Catherine’s Point. Since SOEC is a test facility generating sufficient energy to power more than 8,000 homes, this project is anticipated to enhance the UK’s marine energy production and help tidal mechanism developers test their turbines on a full commercial basis. There has already been firm interest in the project from the private sector, both in this country and abroad, although no formal announcement has been made about which type of tidal technology is to be used. George Brown, deputy leader of the Isle of Wight Council, has said: "We have for some time felt that the opportunities presented by the Island’s tides have not been taken full account of in the UK’s energy planning and have worked hard to raise the profile of these possibilities within the renewable energy sector." This project looks set to do just that. The most recent technology used within the marine energy industry is a vertical axis turbine, which is planned for use in the Lashy Sound of the Orkney Islands. Scotrenewables Tidal Power, a renewable energy research and development business based on the Orkney Islands, is trialling this novel technology. "Technology for harnessing marine energy is advancing rapidly, providing a number of other, more viable options." This turbine will be attached to a mooring base, rather than a rigid base, significantly reducing the cost and complexity of installation. Structurally, it comprises of a floating cylindrical tube attached with two twin horizontal axis rotors that extract the energy from the tide. This energy is then converted to electricity for carrying to shore. The retractable legs of this turbine provide two modes – the operational mode, with the rotors down to generate power, or the transport / survivability mode, with rotors retracted in order to allow the system to be towed into harbour or to reduce stress in heavy seas. In severe storm conditions power generation will automatically cease and the rotor legs will adjust to survivability mode. John McGlynn, project development manager at Scotrenewables, says: "The Lashy Sound project is a realistic-scale proposal in what are already familiar waters for the company. Also, because of the inherent low costs of the SRTT tidal technology and the revenue support on offer for early stage marine energy projects, each phase of the project will ‘stack up’ financially." He also explains that: "This project will be the vital, final array-scale demonstration stage in the technology commercialisation process prior to commercial rollout in the UK and further afield." "Harnessing this energy could provide around 20% of Britain’s electricity needs." A unique scheme has been proposed for Stangford Lough in Northern Ireland, which is to be trialled by the Swedish-based technology company, Minesto. Their system, dubbed ‘Deep Green ocean kite,’ comprises of a kite construction with a wing and turbine. This is attached to a predetermined point on the sea bed and as water passes over the wing, a lift force is generated, allowing it to move efficiently through the water and rotate to generate electricity. This is a major development in the design and construction of tidal power technology, with the potential to double the amount of marine energy the UK can produce. The company claims that Deep Green is the only currently available solution that works in slower currents. Anders Jansson, CEO of Minesto, says: "There is increasing interest in our solution for cost-effective marine energy production from low velocity currents… Deep Green expands the total potential for marine energy considerably." As a result, he explains: "There is very firm private sector interest in the project and we are very excited about the prospects for the green agenda and the local economy." Paul Catterall, Wave and Tidal development manager at The Crown Estate, says: "The Crown Estate is continuing to support growth of the emerging industry and we will be announcing next steps in leasing wave and tidal sites in due course." In the meantime, which of these tidal power generators will prove to be the most cost-effective to construct and maintain and the most efficient at generating energy? This should become clearer within the next few years. It might be that different designs are more appropriate for different coastal conditions. One thing that is abundantly clear is the commitment of both the government and the private sector to producing clean, green energy in the future. Tidal power is certainly making waves in 2012, with the launch of two marine energy parks in the UK. Water-based solar energy concepts such as SUNDy and Hydrélio demonstrate how third generation solar panels are more economical and versatile than previous designs and can tap into the solar potential of the world’s seas. Innovative and economical, concrete gravity bases are the next generation of offshore wind turbine anchors.